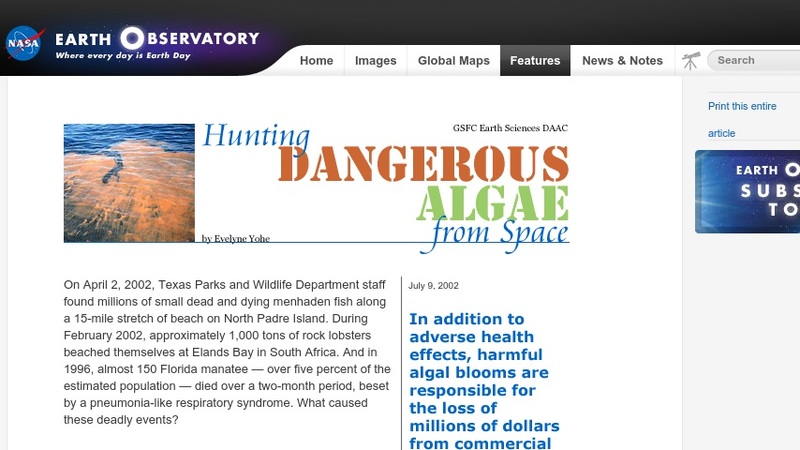 This NASA Earth Observatory article presents information about programs that are monitoring red tide and other harmful algal bloom (HAB) outbreaks from satellite imagery and remote sensing. This program uses SeaWiFS (Sea-viewing Wide Field-of-view Sensor) and MODIS (Moderate Resolution Imaging Spectroradiometer) instruments to detect harmful algal blooms from space. The article features satellite images and color photos of red tide and HAB occurrences. It also features a glossary on/off function in which readers can choose to have terms highlighted and linked to a corresponding glossary.